Here’s a typical un-project: a group of images born in the editing process, given shape, meaning, narrative, etc. entirely retrospectively. I suspect almost everyone with a camera works like this, at least sometimes. Many don’t work any other way. Did Gary Winogrand ever set out to do a project, in the contemporary sense? Or did he just take pictures, leaving all the usual concerns for later (or even for someone else)? Usually I’m a project guy, not a walk-around-with-a-camera-all-the-time-and-see-what-happens guy. I often go months without picking up a camera, and then after dusting it off have to try to remember what all the buttons do. But the cell phone is always with me. And sometimes I’ll get inspired by something unrelated while working on a project. Or I’ll take the camera on vacation, or will have it in my bag on the way to doing someone a favor*, etc. etc. This series came about when I was carrying a camera around for the Sub/Culture project. I started seeing the saddest stuffed animals. Everywhere. Some were predictably sad, like the memorial by the train tracks (above). 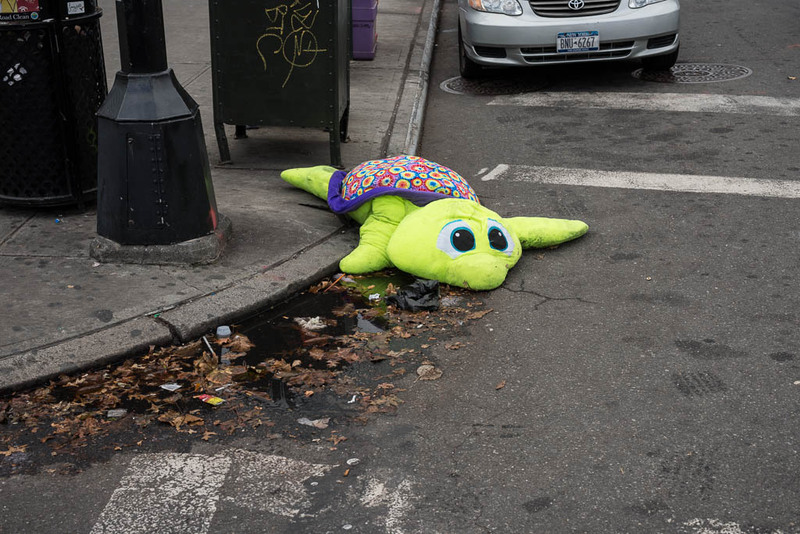 Others were a bit more mysterious: how does a 4-foot Winnie the Pooh end up face-down in a puddle in South Brooklyn? Is this a sign of End Times? After a few months, I noticed an accumulation of these pictures on my digital lightbox, and so gave them their own category. I’d need many more of these, and much more rigorous edit, to consider it a project—and to put it in front of curators or collectors. Probably the memorial pictures wouldn’t belong. The baby shower sign really wouldn’t. But we’ll never know before the rest of the pictures show up. For the sake of the stuffed animals, let’s hope it never happens. Click for more from the series. *before you ask, no, I’m not going to do your headshots. It wouldn’t go well. The last two friends who insisted that I take their online dating pictures stopped talking to me for about 6 months.